Greater Urban Density is the absolutely necessary (but alone not sufficient) ingredient for more liveable and sustainable cities. Everything else depends on getting density right. A clear consensus on “density done well” emerged from the neighbourhoods we visited in Europe. While there were variations on the theme is was mid-rise residential density that characterised the most liveable neighbourhoods. From three to four storey terraces and apartments up to six to eight storeys depending on the area and its land values. This didn’t mean no highrise development (of 12 floors and above) but these were largely one-off landmark buildings like the Turning Torso in Malmo’s Western Harbour or small defined pockets of one taller residential towers. This was seen to be the ideal density mixture that meets a wide range of community needs from families to aging member of the community. None of the best practice liveable and sustainable neighbourhoods we visited had single-lot, detached, residential housing as their primary built form, if at all. Large single houses are seen as not only expensive and energy inefficient but they also resulted in too few people in an area to enable the other services from shops to childcare to be close to most people. Greater Perth has an extremely population density of around 17 people per hectare which inevitably results in urban sprawl. At the heart of the future of liveable cities is in making them “cities of short distances”. A short trip to the shops, a short stroll to the local park, a short commute to work, a walk to drop the kids off to child care – these are all key ingredients for more liveable cities. Perth though is a city of long distances exacerbated by low suburban densities and a lack of mixed uses in our communities. So the Perth-ite spends around an hour a day commuting in their car because, according to the RAC Perth is the city has the lowest proportion of residents living within 10km of their workplaces of any Australian centre. With uneven public transport access it means many depend on their cars – all attributes that are the antithesis of liveable cities. Having no choice but to drive your kids to school or to drive to the shops to get essentials is hardly environmentally sustainable either. This doesn’t mean the very liveable developments we visited were anti-car. The third lesson was that you need to provide for car use but need not design your suburbs around them. Or to put it another way: keep cars to fringe of residential developments or at least design them so cars don’t dominate. Children playing safely in the street is without doubt the ultimate symbol that a liveable community-focused neighbourhood has been created. This means very low speeds and limited parking at the core of neighbourhoods with most of the parking designed on the fringe underground or in multistorey parking stations. The above approach is largely dependent upon (or at least greatly assisted by) the important fourth lesson of the trip – upfront investment in public transport and cycling infrastructure. By upfront I mean ideally before the first resident even moves in. This ensures the best habits are embedded early on. This lesson was clear from to the Netherlands to Germany and beyond. In Australia we normally do the reverse – wait for patronage numbers to rise to justify the public transport investment or cycling numbers to rise to justify bike lanes and infrastructure. The experience from Europe turned this thinking on its head. Both the West Australian (https://au.news.yahoo.com/thewest/a/28480913/white-gum-valley-homes-challenge-old-infill-ideas/) and the ABC (http://www.abc.net.au/news/2015-06-17/green-energy-for-new-white-gum-valley-residents/6553896) ran good pieces on the Kim Beazley development in White Gum Valley (my street in fact!). Great to see this level innovation and collaberation between, Landcorp, City of Freo, CSIRO, CUSP, CODA and the local community. The renewable energy technology described below in combination with some clever water options from Josh Byrne and Associates will make this a good example of density done well. A new residential complex south of Perth will feature solar panels and battery storage technology, providing financial benefits for tenants and investors. Landcorp’s White Gum Valley project will include apartments, townhouses, maisonettes and single home sites, housing more than 150 people on the former Kim Beazley school site. The WA Government said the use of renewable energy technology would cut energy and water bills by about $1,200 a year for tenants in the complex, which will feature a demonstration housing project managed as a strata development. Solar PV systems have not been widely used on strata developments, because the cost of the technology traditionally falls on the shoulders of the investors while giving the tenant the benefit of cheap power. But Curtin University, Landcorp and the CSIRO have partnered to develop a system which benefits both investors and tenants in White Gum Valley. Curtin University sustainability specialist Jemma Green said under the system, residents would pay their energy bills to the strata body rather than the energy retailer. “This is an Australian first and I’m only aware of one other project in Italy which has actually done this,” she said. “The solar panels and the batteries sit on the strata and are owner-managed by the strata manager. Ms Green said the new business model overcomes several barriers which have prevented solar technology from taking off on strata developments. “Barriers include getting approvals from Western Power, designing the system so that it is compliant with strata laws is really important, and also designing a system which is going to charge no more than what [residents] would pay from Synergy,” she said. Ms Green said the project would be the focus of a four-year study at Curtin University into low carbon living, and is confident it will succeed. “People are willing to buy apartments that perhaps cost a bit more, but the pay-off is they don’t pay the electricity bill,” Ms Green said. Landcorp’s chief executive Frank Marra agreed. “Investors will see that customers and their buyers will really want to be in an estate where their ongoing living costs are going to be lower, so people are going to vote with their feet – they are going to want to buy into these estates,” he said. The development is exemplary of what the WA Government wants to promote for infill housing. Minister for Lands Terry Redman said he thought the Government was starting to win the somewhat emotional debate about infill developments. “What has been designed here is something that should be affordable to the Gen Y marketplace, but of course meets the sustainability standards and the infill densities we want to see in broader developments in Perth,” he said. “We are certainly dealing with a history of how we think development should happen – trying to shift that is difficult. “The culture is still for the Greenfield developments in the typical housing-type plots, [and] what we need to have is demonstration sites so people can actually see what it looks like to be a part of these. “It is unacceptable in Western Australia that we can progress towards 3.5 million people by 2050 and not have a level of high-density infill development. Mr Marra said he believed the scheme would become the future norm, as other developers saw the commercial benefits. “As Perth grows there is going to be a greater share of housing that needs to be provided through infill development,” Mr Marra said. Two of the White Gum Valley sites for apartment development are scheduled for release in August. Artist impression of Landcorp’s White Gum Valley development. Last stop: “Concentrated de-concentration” in the Netherlands. The final country we visited on the study tour was the Netherlands which had a great urban planning philosophy here that can in part be neatly summarised by the phrase “concentrated de-concentration”. Valthorst has set itself a target of 10% below the rate set by the Government for emissions and energy consumption. The developments make use of durable materials and energy resources, including district heating by means of an waste to energy, solar panels, efficient use of space (clustering of amenities) and high-quality architecture. Rain water is retained on site. Underground waste storage is an innovative Dutch practice that encourages recycling. Vathorst sustainability credentials include the centre been made car free, with local services and public transport links within walking distance of every new home and a strong focus on cycling as a viable alternative to the car. Cars are banned from the city centre and are restricted in the new developments, to reduce car dependency. High quality cycle and footpaths intersect all neighbourhoods. To encourage the use of public transport there is a maximum walking distance of 400m to bus stops from every house. The Dutch Government with the development authority even paid for an upgraded railway station in advance of the population needed to support it. In my final post on the trip I hope to draw everything we have seen into a key lessons learnt. They had a light rail system built to run down a green central spine of the development. Tram line in the green belt also reduces noise by 30-40%. Once again strong government leadership was evident. In Rieselfeld before the first resident moved in the light rail was in place and running. In Freiburg it was planned and sent in before the development of the area was complete. Car parking provided but not as part of the housing. Instead parking is provided in multi-storey carparks nearby. Having cars predominantly on the outside means streets can be kept low speed shared zone streets (cars can come in to load and unload etc) where pedestrian have priority. It also meant the street scape is not dominated cars and garage doors but is full of green gardens and quiet narrow streets which safely children play in. Prof Wulf Daseking was clear communities and to choose between private car circulation and the quality of street life – you can’t have both. Design your new communities with a focus on families. In Vaubaun 32% of the population of 5500 is under the age of 17. The development was designed for this. The maximum building height, 12.5 metres, basically accommodates 4-5 storey structures, allowed parents to keep an eye on their children. Both were built to the highest levels of environmental sustainability. Vaubaun is globally famous for not only having the first house that produced more power than ii used but for then building Solar City a clever mixed use, highly sustainable development. 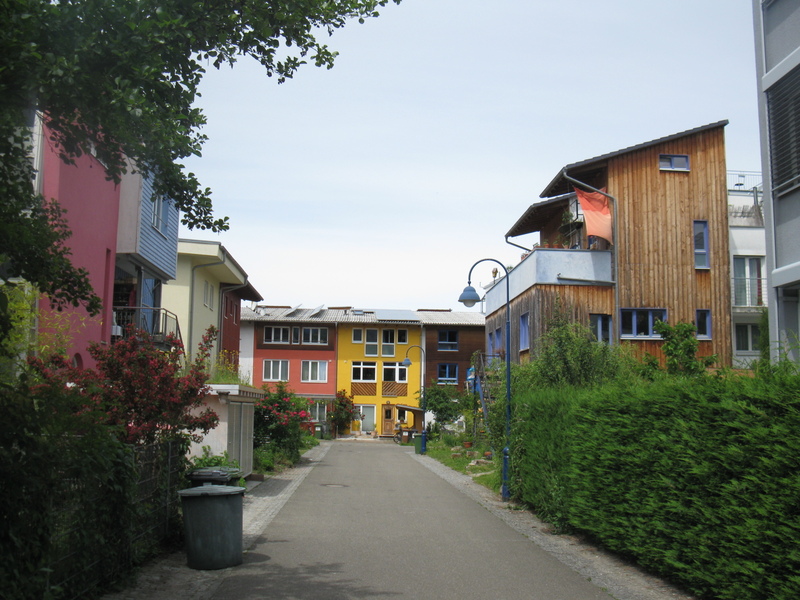 In Freiburg it has been found that although better architecture and construction can add 8 to 14% to the cost of new homes, it is more than repaid through energy savings. Prof Hall finished on Freiburg to say that the overall lesson is that new city quarters can be developed in a way that as attractive and valuable as an historic one, provided there is sufficient long term investment up front in the public realm and quality infrastructure. (262). After seeing the the sustainability masterpieces of Vauban and Rieselfeld, I completely agree. One of the great things about going on a well organised planning study tour is not just that you get to see great liveable places first hand but that you get to hear directly from the experts that helped create them. Freiburg was a real highlight in this regard as we got to hear from Prof Wulf Daseking who was pivotal in Freiburg’s transformation. Prof Daseking was a planner in Freiburg from 1984 to 2012 and former a powerful collaboration alongside Mayor Breuer who was in his role for 20 years to make Freiburg into one of the most liveable and sustainable cities on the planet. Prof Wulf Daseking started with a quote he attributed to Jamie Learner: “Cities should have a dream”. Freiburg’s dream was to be a city of short distances, missed use, quality public transport, diverse housing, community engagement, and quality green spaces. I will go into depth in relation to the amazing new development areas of Vauban and Rieselfeld in the next post. In this post I want to focus on Freiburg as a whole and why it is such an inspiring, sustainable, and liveable city. Energy is where the Freiburg story starts. The publication in 1972 of Limits to Growth followed by the 1973 oil crash were very influential on the thinking of Freiburg Council. This was also a time in which 17 new nuclear power stations were proposed for Germany including one in Freiburg. This issue brought the Freiburg community together to reject nuclear power and show it was not required as investment in renewable energy could ensure future energy demand was met more sustainably. Transport. Cars optional. Prof Wulf Daseking started by saying that for public transport to be successful it must be safe, quick, fast, convenient, and clean. And Freiburg has done this very well. As a result 38% of young people in Freiburg do not even bother to have a driver’s license as they just catch public transport or cycle. This investment in public transit in Freiburg has been made possible as the German state government will by 80-85% cost of new tramways. It extended light rails to areas before the people even moved in. Public transport was so mainstream in Freiburg that most hotels (including ours) even offer as a matter of course free public transport tickets to all hotel guests. 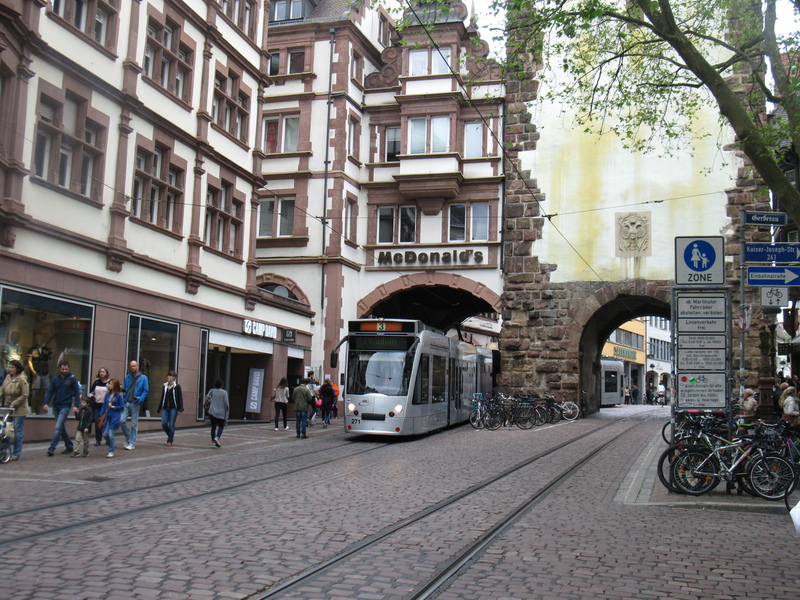 You can bring your car to Freiburg if you like the CBD of Freiburg is vehicle free except for deliveries between certain hours. Instead they provide multi-level car parking on the ring road around the Freiburg central area. Freiburg is a city that works really well on every level. Despite a smaller population it was a buzzing centre, no doubt assisted by the thousands of university students that live in and around Freiburg’s centre. Prof Peter Hall describes Freiburg as “the city that did it all” and I was truly inspired. Affordable housing from Malmo, Hamburg and Freiburg to Fremantle. Housing affordability in Europe, as in Australia, is a major issue and it has been a major theme of the study tour. What many of you might not know is that this European liveable cities study is based on a book by Peter Hall called Good Cities, Better Lives: How Europe Discovered the Lost Art of Urbanism. It has been interesting to hear how leading cities in Europe are dealing with this challenge. This was area that that wonderful Malmo was still grappling with. It has not been as successful as it hoped was in providing affordable housing. While diverse and affordable housing was a key focus from early in the project, the success of the development that I described in the last few blog posts meant it became a desirable place to live and pushed up prices in Bo01. Following stages in the Western Harbour development have learnt from this and the third stage now underway will have 60% of the planned 600 apartments as affordable housing. The German cities have especially come out with a creative way of dealing with affordability. 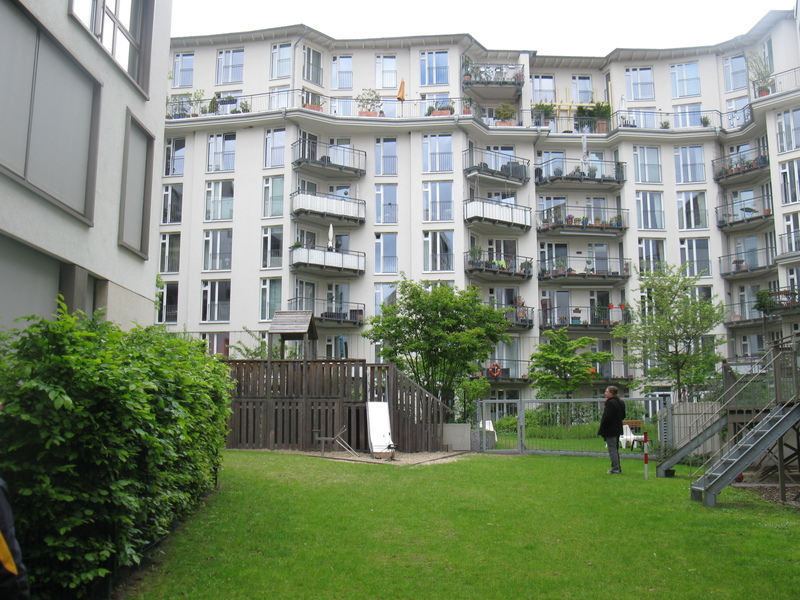 In Hamburg we did a tour of Haffen City – a redevelopment of the old docklands area. When completed Haffen City will have more than 7000 new homes, of which around 2000 will be subsidized housing. In total 12,000 residents will be in the former port area. Here we looked at a family friendly high density housing development. These included a high density school which had most of its play area on the roof. Directly next to the school live the new occupants of a joint building venture of 55 family homes. This was built using a model call Bangruppen – a form of cooperative housing and building groups that have substantially reduced the cost of housing. Peter Hall estimates that these cooperatives save on up to one third on the cost of housing in part because there is no developers profit (page 260). This process is assisted by the city in which they facilitate bringing people with similar or compatible housing demands together. This resident group then pays a deposit and co-designs the development together with the project facilitator. Not only does it bring costs down and ensure the design suits the future residents but it also build social capital as everyone in the building knows each other before they even move it creating a strong sense of community in an area. Here are photos of the outcome in Haffen City in Hamburg. This model was also widely used in Reisefeld and Vauban in Freiburg. Peter Hall argues is one major precondition for making this model work is that the city owns the land and puts in place the necessary infrastructure (roads, sewerage, water etc) to enable the development to occur. The city’s investment is then recovered by selling of sites to builders and individuals. 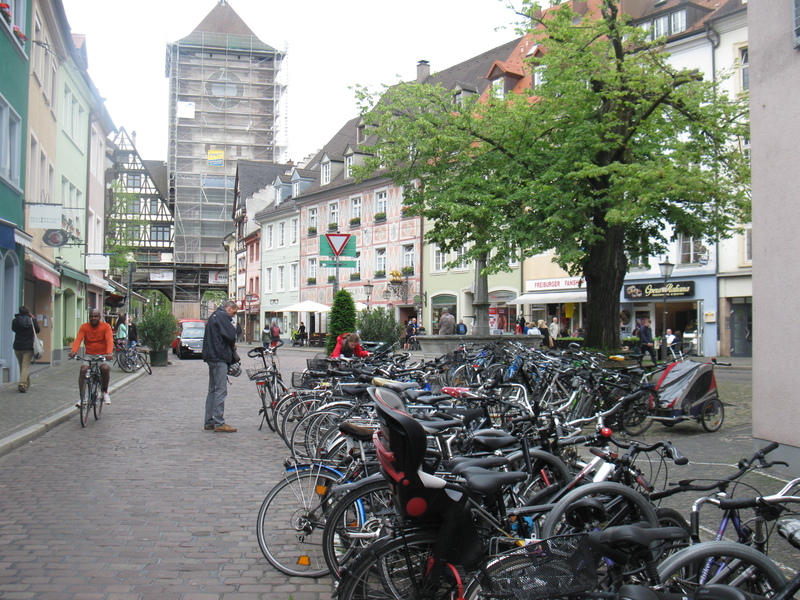 In Freiburg this has worked extremely successfully and according to long-term Freiburg planner Prof Wulf Daseking the city in the end was never a cent out of pocket – it funded itself. The other upside was this model resulted in most lots been sold to small investor and owner groups creating architectural diversity throughout the development. In Freiburg over 150 Bangruppen have been built and Malmo has taken this model and is applying it to later stage of the Western Harbor development to bring down building costs and increase affordability. Jumping back to Fremantle a similar model is about to get underway on part of the old Kim Beasley school site now been redeveloped by Landcorp in White Gum Valley. A housing cooperative called SHAC (Sustainable Housing for Artists and Creatives) is working with Access Housing who has purchased the land to build affordable housing and workspaces for artists. It is a great project and one which may will be the future of more diverse housing in WA. Watch this space – Bangruppen might make it into the Australian vernacular yet. Final Malmo piece – nature and density done well. I wanted to finish off my discussion of wonderful Malmo with a pictorial piece on how the Western Harbour focused strongly on reintroducing biodiversity, nature and unique play spaces into a medium density development. The development required 50% of plot area should be green space.They did this through a combination of great parks, green roofs, open drainage systems that drain into pools in courtyards, local plantings and lots of open space and trees space. It makes the whole development feel green and welcoming and it softens the dense urban elements making the whole place extremely liveable – despite the often freezing weather. I hope you enjoy these photos. Water then runs into ponds with reads that purify it.